This Chrysanthemum is known as a ‘charm’ Chrysanthemum. Charms naturally grow into a dome habit without the need to pinch or train them in any way. They are more tender than the hardy types, so keep them indoors in a cool room or porch. 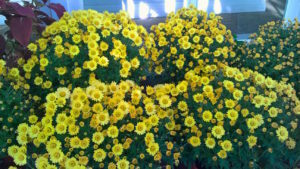 These bright yellow Chrysanthemums are smothered in hundreds of blooms which brighten up the dreariest of November days. See them now in the Mediterranean House.